What did you do last Friday night? I bet none of you went to a mime performance. I also bet none of you are jealous. 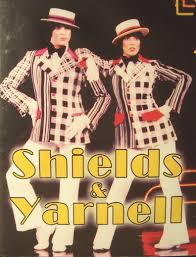 Unless you are big Shields and Yarnell fans and are still lamenting the cancellation of their variety show back in ’77. And what was the fascination with variety shows in the 70’s? Sonny and Cher, Carol Burnett, Hee Haw, even the Muppets. Weird. It’s like detective shows in the 80’s. But this is what happens to you once you have kids. They inexplicably become interested in things that provide you with nothing but bafflement. As far as I can tell, when it comes to the face painting spectrum, mimes anchor one end while ninjas anchor the other. Obviously. And they sometimes perform a really, really crappy variation of the robot while on stage. Granted, I could be wrong. But please explain to me how exactly none of my kids wants to play basketball. None. Zero. The one sport in which I showed a semblance of ability is of no interest to my kids. So far one is showing a growing interest in history. But it is taking every last ounce of my self-control not to smother that interest with a Beverly Goldbergian avalanche of helpfulness. To be completely honest I had no idea what a mime show was. Or how it would be conducted. Which means it’s a lot like the concept of the NCAA Tournament to Husker fans. According to Rye and her friends, mime is the art of acting without words. Best thing about it was that we were able to enjoy some Foreigner, Journey and Otis Day and the Knights. Yeah, there were, and I’m just spitballing here, about 428 skits. Or maybe it just seemed like that. No, seriously, I’m guessing around 30 or so little skits, none of which were more than a few minutes long. Each featured a song you most likely heard at some point. Wasn’t expecting to hear Weird Al’s “Eat It” but c’mon, who doesn’t think Weird Al is a genius? But here’s the thing you really don’t realize until you get there – you spend the first 2 or 3 skits attempting to identify your kid. Not kidding. When there are 35 blonde girls in pony tails and white face paint, it ain’t easy. Oh and they sold cookies at intermission as a fundraiser. And who am I to stand in the way of funding for the arts! We love parent-teacher conferences. And what’s not to love if all you get are affirmations, smiles and sunshine? I mean its what the President must feel like after every meeting with his staff. Because nobody really believes Jay Carney says anything to the President except, “Yes my liege.” And Biden doesn’t’ really bring anything to the conversation. Except maybe a beer bong. But through some genetic miracle we’ve produced a child who despite all of her annoying and infuriating 14 year old tendencies and behaviors, has managed to mold herself into the Steve Largent of 8th graders. She studies, prepares, participates in the class, shows leadership qualities, get good grades, runs good routes, blocks on running plays and rarely, if ever, drops a 3rd down conversion. English teacher says she’s a serious student who still has fun, puts thought into her work and has no time for the people (boys) trying to get attention in class when she should be listening. Tough to translate that any other way than an awesome, awesome job of parenting. While the teacher is talking I’m seriously thinking, man, this is what it must have been like for Phil Jackson back in the 90’s. Math teacher has trouble talking about her without smiling. She lets us know that Rye is a joy to have in class and it is obvious when she’s not there. She participates in and understands the lessons. This, if you have been keeping score, means two of our three children have shown an aptitude for math. It is with absolute metaphysical certitude that I can state they inherited that from Mom. If they were showing an aptitude for making stuff up, disliking the Ravens and nachos, then yeah, that’s my kid. Anyway, Social Studies teacher is next. And his take on Rye is strikingly similar to the English teacher’s take. As a fellow history dork we lament the seeming lack of interest among 14 year-olds in the Constitution, Valley Forge, and the relevance of Federalist #51 to today’s political debate. My reaction? Mental mic drop. Walks off the stage. Boom. You know, it is extremely difficult to unsmile after a teacher tells you that about your child. Especially when you know there are two more coming along and it may very well be the last time any of these teachers utter a sentence that bears any recognizable resemblance to one you just heard. To us anyway. Not the clothes and not the over participation in my day to day 8th grade life. But, again, my life pretty much consisted of being cool, playing basketball and watching MTV. I didn’t really turn into a selfish teenage a-hole until my last year and a-half of high school. Now, if you parents were the Goldbergs, I can understand a certain level of embarrassment and bewilderment at their behavior – especially if it happened at what are generally considered key points during your adolescence. And maybe that happened to me but it must not have been incredibly momentous because I don’t remember any of them if they in fact happened. I do remember when I scored 33 points in a basketball game. November of ’83. I remember the first time I got my hair cut the way I wanted it. Rick Springfield inspired many of us. I even remember the first time I watched Thriller and my buddy Greg and I thought we could choreograph our own moves to it. Recently, we were invited to a wedding. And by we, I mean all five of us. The mom of one of Rye’s best friends was getting married. As she’s in a similar age demographic, music which we had some familiarity and a certain level of comfort was played. And we danced. Did you see what I did there? I weaved a sweet top 40 hit from The Hooters into this paragraph. Anyway, lots of people were dancing. One dude, much older than me, really only had one move and it was essentially a jumping-jack. He was having a great time. He also didn’t really limit his moves to any genre of music. His rate of movement simply slowed down or sped up depending on the song. A few dudes were doing the white man’s overbite, some folks looked as if they had missed their cardio workout for the day and were determined to get it in during the wedding. The rest of us pretty much looked like most of the folks in the “Happy” video from Pharrell Williams. Whatever. Like you haven’t thought of doing the same thing. Quick thought…how do the Poles and the rest of eastern Europe not walk through the opening ceremonies giving the double middle finger salute to everyone associated with the Soviets in that stadium? Not kidding either. Anyway, recently I mentioned that I found a new radio station which plays old stuff from the 80’s and 90’s. While not always on the money with cool stuff, here’s last Friday’s ride in music on 94.1: Paula Abdul with Straight Up, Robbie Nevil singing C’est La Vie, Traveling Wilbury’s doing, well doing something. I honestly can’t remember. Mostly because I thought the Wilbury’s were awful. I’m sure they had a good time working together. But virtually no one had a good time listening to them. So I treat them with the same deference I normally show Drunk Uncle Biden. But right after the Wilbury’s, Duran Duran came on with Something I Should Know and finally U2 doing I Have Still Haven’t Found What I’m Looking For. To be perfectly honest, I was kinda disappointed. Straight Up is one of Paula Abdul’s best. Arsenio’s in the video. Boom. Also reminds me of spring semester of freshman year of college. But, it’s Paula Abdul. If I’m going to pick a song from say, February of ’89, I’m picking Paradise City by Guns N’ Roses. Oh and I’m never picking Robbie Nevil. My older sister is going to be a bit heartbroken about that. Granted, Limousines is a good song. But, seriously, I’m never picking Robbie Nevil. If the summer of ’86 needs me to pick a song, its going to be Take It Easy by Andy Taylor from the American Anthem soundtrack. I’m not bragging. It is obviously somewhat embarrassing. Kinda surprised I even admitted it. After that you have Duran Duran singing something that isn’t Hungry Like Like The Wolf, which of course means its terrible. What? Name a song that you like by Duran Duran. Union of the Snake? Nobody likes that song. The Reflex? Tough to get past all that terrible 1984 clothing. Yeah, so my point stands. I like U2. And songs from The Joshua Tree are mostly good. But if we’re going to start talking about what we liked in 1987 then yesterday is an interesting story. The ride in music peaked with Let’s Go by Wang Chung. Which led me to youtube and I immediately was lost in the youtube vortex. The youtube vortex is a wonderful place and considering how much time I spend there, you’d think I’d know my way around enough not to get lost. I mean I’ll be watching an old episode of Magnum, P.I. and then just sitting right there off to the right are some suggested videos. I’m powerless to resist them. Powerless I say! The full game broadcast of Browns-Colts from November 9, 1980? Hell yes, I’ll watch that. One of Bill Cowher’s 4 NFL starts at linebacker. Do I want to watch an aerial tour of Nikumaroro the island on which it is theorized that Amelia Earhart was marooned and died? Hells to the Yes! It was about this point that I remembered why I was inside the vortex in the first place. But listen, watching the Let’s Go video really is the gateway drug to 1987 nostalgia. And it reminds you of the dangerously high level of cheesiness in 80’s videos and, well, the vortex is a confusing but alluring place. Let’s Go turned into Hypnotize Me, which led to Midnight Blue which led to You’re Jammin Me, which led to Heart and Soul, which lead to I Know What I Like which led to Should’ve Know Better. And listen if you’re going to end up somewhere singing along with Richard Marx, well, you best be alone. Thankfully, I was. But Dammit man! How are you not impressed with Jack Hues’ leather fringed jacket in the Hypnotize Me video? You can’t. It’s simply too cool. Mom’s been gone since Thursday afternoon. The 2014 National Dance Team Championships were in Orlando this weekend. What? You didn’t hear? Scheduling it on Super Bowl weekend proves once and for all the entire dance industry is run by the scheduling impaired/adverse. Anyway, Mom went down with Rye. That means I’ve been home with Kinz and Bails since then continually wondering why we’re paying for a trip to Orlando for a dance competition for an 8th grader. It’s not like the competition is populated with college scouts determining who is going on the scholarship offer list. But whatever. Here’s kinda what’s gone down in our ‘hood since Mom left. I take the girls to dance as I do every Thursday. Except this particular Thursday their 86 year-old dance teacher kinda had it with some of the shenanigans displayed by them and their classmates. Seriously, their teacher is 86. Or 80 something. I don’t really know. But she remembers Pearl Harbor and might’ve dated Bronko Nagurski from the ’23 Bears. And she has ups. Not kidding. I’ve seen her catch actual air. I know some 46 year-olds who can’t jump anymore. She also has that freaky superhero dancer balance. Oh and a reminder…she’s 86. Time to put down the Cheetos and get your arse in shape because there’s an 86 year-old who, if she needed to, could Chuck Norris roundhouse kick your arse. Anyway, she laid some of that old school discipline down on the class. We went directly from dance to Bails’ 4th grade orchestra concert. That means once again we have the in-car wardrobe change. But the girls have done this so often that its really not a big deal anymore. What is a big deal is that I remember to bring snacks. Strawberry Nutrigrain bars, pretzels and water. Check. We arrive at the concert on time. Good job outta me on the logistics. As Kinz and I are sitting in the stands we scan the floor of the gym for Bails. We find her in a row with all her buddies. Weird thing is that while they all have instruments, Bails does not. How sure was I that she walked into the concert with her viola in its case? Pretty darn. Also pretty sure that it isn’t out of the realm of possibility that she has somehow lost track of its whereabouts during her journey from the front door to backstage to the gym floor. Adding to the intrigue is that she made at least three trips from her seat to the backstage door emerging from the door each time without an instrument until, with just minutes to spare before the start of the concert, she finally heads back to her seat with the viola. Concert was your typical 4th grade orchestra concert. Although afterwards, Bails told me that she didn’t know one of the song. At all. They had practiced it for the first time Thursday morning. I told her you couldn’t tell. To which she responded, “well I was hoping everybody else knew the song and I could just fake it.” Sound strategy. Cliff Stoudt did for the entire 1983 season as the Steelers quarterback. After school the girls convinced me to take them to see Frozen. I agree with certain stipulations. 1) I get to go to the hat store. 2) We’re going to eat dinner somewhere that costs less than $15. 3) I’m not going to Claire’s to look at crappy trinkets. I almost recorded a blowout win. Ended up having to set foot in Justice. But after having been inside the same Justice during Christmas shopping season, this went smoother than a Glen Rice jumper during the ’89 Tourney. At one point we were the only three people in the store. It was glorious. Didn’t find a hat but did eat at Subway for just under $14. Boom. Frozen was pretty good…if you’re a girl under the age of 12. But it was fun hanging out with Kinz and Bails. And I ate a giant tub of popcorn. It was good. I have no regrets. Went out to breakfast and enjoyed the greatest of all breakfast dishes. The breakfast sandwich. Cheese, ham, eggs, English muffin. Mmm… I let the girls have Diet Coke for breakfast. It was as if I cured cancer, found Amelia Earhardt and went back in time to strike out Francisco Cabrera in Game 7 of the ’92 NLCS to win the pennant for the Pirates. We didn’t do much else the rest of the day. Bails had softball practice at this cool indoor facility. Oh and I’m the proud owner of $150 in new softball bats. New bat standards for 2014 so you can only use bats with the official insignia clearly displayed. Pretty surethe USSSA and the bat manufacturers are cahooting. Didn’t have to get up early because we went to church Saturday evening so all I had to Sunday morning and was wake up and read the paper. Oh and watch Bails eat a whole bag of donuts. Whole bag of Little Debbie Glazed mini-donuts. Don’t get me wrong, if you are going to eat a whole bag of something, you could do worse. Those cheeseburger potato chips for example. Seriously though, that’s a lot of donuts for someone who is built like a pencil. Went to the gym while the girls went to softball camp and received 90 minutes of hitting instruction from the local high school coaching staff/varsity players. They loved it. Hopefully it translates. But I spent a good portion of that time on the treadmill in front of a TV that COULD NOT BE CHANGED watching golf. F’ing golf. There was college basketball going on at the same time. Hell, there was even freaking hockey being played. I would have been happy with Property Brothers. Instead I’m watching Craig Stadler’s son figure out how to play a ball he hit into a freaking cactus. Yeah, and the ball is literally suspended about 3 or 4 inches off the ground because it appeared to have been impaled by one, or several, of the cactus’ spines. What the hell with the TV’s in gyms that don’t change channels? If you are going to have multiple TVs in front of freaking treadmills, one of them needs to be on an all sports station FOREVER. Not freaking Food Network. Unless Giada is on. But otherwise set the damn channel to ESPN or NFL Network or even Fox Sports 1. But don’t force me to watch several guys stand around a freaking cactus looking at a white ball for 15 freaking minutes. How the hell are you supposed to motivate yourself when you’re watching a fat guy win $1.1 million when part of his day involves standing around looking at a freaking cactus! Eventually though we made it to a buddy’s house to watch the Super Bowl. He’s a Broncos fan. He had a bad day. But the girls had fun with his daughter. Mostly because all they ate was sugar. Not really kidding. You know what fun dip is? Its sugar. Pure uncut sugar. It’s like crack to grade school kids. They reacted to it the same I way I would if you gave me access to the NFL Films vault.